SPSS – What Is It? You are here: Home Basics Introduction to SPSS SPSS – What Is It? SPSS means “Statistical Package for the Social Sciences” and was first launched in 1968. Since SPSS was acquired by IBM in 2009, it's officially known as IBM SPSS Statistics but most users still just refer to it as “SPSS”. Let's now have a quick look at what SPSS looks and feels like. This sheet -called data view- always displays our data values. For instance, our first record seems to contain a male respondent from 1979 and so on. A more detailed explanation on the exact meaning of our variables and data values is found in a second sheet shown below. 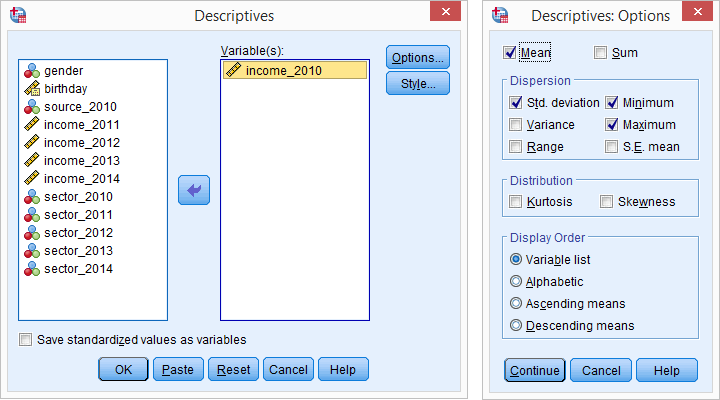 An SPSS data file always has a second sheet called variable view. It shows the metadata associated with the data. Metadata is information about the meaning of variables and data values. This is generally known as the “codebook” but in SPSS it's called the dictionary. Doing so opens a dialog box in which we select one or many variables and one or several statistics we'd like to inspect. SPSS Output items, typically tables and charts, are easily copy-pasted into other programs. For instance, many SPSS users use a word processor such as MS Word, OpenOffice or GoogleDocs for reporting. Tables are usually copied in rich text format, which means they'll retain their styling such as fonts and borders. The screenshot below illustrates the result. The output table we showed was created by running Descriptive Statistics from SPSS’ menu. Now, SPSS has a second option for running this (or any other) command: we can open a third window, known as the syntax editor window. Here we can type and run SPSS code known as SPSS syntax. For instance, running descriptives income_2010. has the exact same result as running this command from SPSS’ menu like we did earlier. We'll now take a closer look at each one of these features. For getting things done fast, SPSS contains many numeric functions, string functions, date functions and other handy routines. Right, I hope that gives at least a basic idea of what SPSS is and what it does. Let's now explore SPSS in some more detail, starting off with the Data Editor window. We'll present many more examples in the next couple of tutorials as well. Thanks for this overview which was helpful. I will now look at video clips of real data being entered to help with analysis of data I have collected.